NEWS: I'm back in WoW. I'll try to update addons after catching up, especially if they are bugging out. Golden Ticket is an LDB data provider that takes over the functionality of the GM ticket status frame. It will hide the default frame and show the data contained in it in your LDB display of choice. If you do not have an LDB display, this addon is also usable via an optional minimap button. Click the minimap button or LDB display. 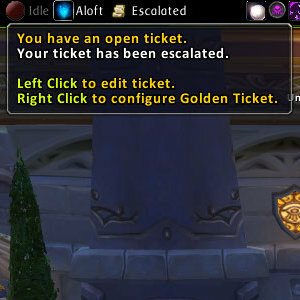 Type /goldenticket in the text input window. Open Blizzard Interface Options, click AddOns and select Golden Ticket from the list. Golden Ticket still needs to be localized to several languages. Please visit the localization page for the pending languages. Verified Cataclysm compatibility and repackaged with new localization and dependencies. Bumped .toc to 30300 and repackaged with new dependencies. Fixed for 3.1 and a .toc version bump. Hopefully fixed issues with settings not persisting. If you want to get the latest news of new AddOn releases or work in progress, subscribe to my Twitter feed.